Keep moving pieces on track, hit deadlines, and launch your best marketing campaign yet with this campaign management template. Set clear expectations. Before you kick off work, share a campaign brief with your goals, metrics, and timeline so everyone’s on the same page from the start. Break down briefs into tasks. Move from campaign planning to execution by creating a task for every piece of work or asset that needs to be completed and identifying an owner. Visualize your campaign schedule. Set due dates for every task in your campaign plan and create a master campaign calendar to see how you’re progressing towards launch day. Watch how InVision manages highly collaborative campaigns from start to finish across a remote team. How Bobbi Brown execute global launches as flawless as their products? Savvy marketers learn from their past mistakes and our tips to fix them. Once you use your template, read our best practices to take your campaigns to the next level. 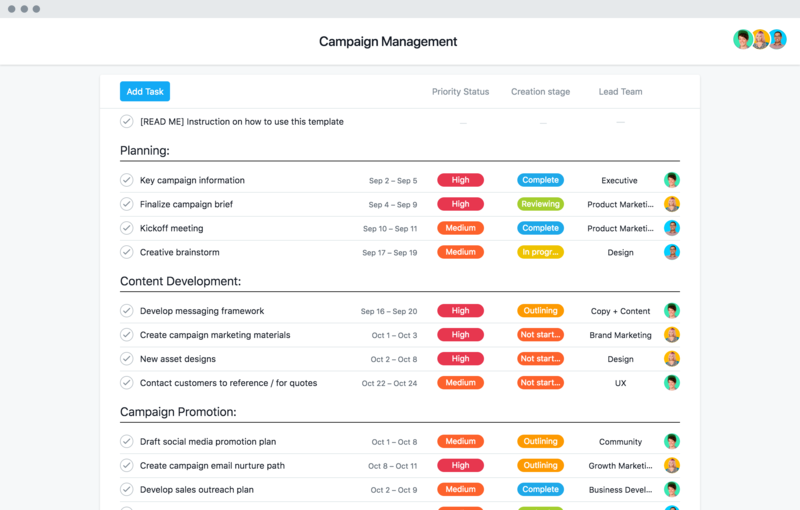 Get our campaign management template and more with a free trial of Asana Premium.